ESPN is a global television network service providing organization that mainly focuses in broadcasting sports programs. The organization telecast both recorded and live sports show along with various other sports based programs. The company name derives from Entertainment & Sports Programming Network. Bill Rasmussen and his son Scott Rasmussen founded the sports programming network in the year 1979 and headquarter of the organization is in Bristol, Connecticut. 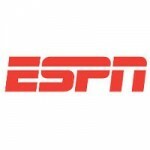 ESPN News, ESPN 3, ESPN 2, ESPN plus, ESPN deportes are some of the sister channels operating under the banner of ESPN. 80% share of the company is owned by Walt Disney Company and the rest 20% is owned by Hearst Corporation. There are currently 1 consumer reviews about ESPN available. Share your review. Please take a note that you are about to post a public review about ESPN corporate office on CorporateOffice.com. This review will be public, so please do not post any of your personal information on this website. If you would like to contact the corporate offices of ESPN, please use their contact information such as their phone number, website, and address listed above to contact them. However, sometimes staff from ESPN headquarters do read the reviews on this website.